Not a daily today, but a larger piece recently completed. This was commissioned by Anne, who grew up in Union but has lived in another state for many years. 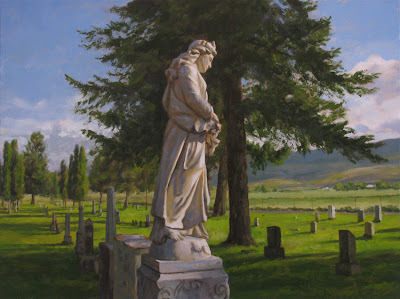 She contacted me to see if I would consider doing a painting of the local cemetery. She told me that as a child she loved to go there. It gave her a peaceful feeling to walk among the stones, listening to the wind whisper through the tall firs. Anne especially loved visiting the grave of Katie Wright, who died in the late 1800s, at the tragically young age of 21. She studied the graceful statue of the young woman and imagined she was looking at the likeness of Katie herself. When she grew older she realized the statue was more likely a generic, mass-produced casting. I somewhat reluctantly agreed to take a look and see if anything might inspire me enough to do a painting. Locating the statue of Katie was easy enough, but I wasn't prepared for what I saw. This was no generic casting, but a hand carved marble of exceptional quality. This anonymous sculptor was a true artist. I studied the statue for a long time from all angles, enjoying its flowing lines and exquisite details. I was captivated, and began to understand why Anne was so drawn to this powerful monument. Now I was hooked, and intrigued about doing a painting. I also wanted to know more about how the statue came to be. A little online research (where would we be without Google?) turned up the story: when Katie died, her bereft parents sent photos of her to Italy, where an artist carved the statue in her likeness. I had another reason to take a special interest in this commission. Katie's father was the banker in Union. My studio is on the top floor of the county historical museum, which was once the bank. The vault is still downstairs. I figure Katie must have at least once in a while trod the same floors I walk on every day. What a wonderful tribute to Katie and that earlier time for your friend, Anne. Thank-you for sharing this painting and the story of Anne and Katie. Fascinating story Don - where would be be without Google! I suppose we would survive but it sure seems to enhance life (I used to use 10 volumes of Arthur Mee's Childrens Encyclopedia). Beatifully rendered painting, especially the statue but my favourite bit is a kind of surreality to the (poplar?) trees and grassy pathways to the left in the distance. Outstanding painting inspired by a beautiful story! Strong composition and great sense of space, peaceful. Hi Don, I trust that you told your friend that the statue was not, after all, some mass produced thing, but a loving rendering of someone who left this world too soon for those who loved her. Thank you for taking the time to tell us the whole story, and what you did with this fine painting to contribute to it. Fascinating! And, a lovely painting. The translucence of the marble and the strength of the trees match this clear and powerful story. Thanks for telling it so beautifully. What a beautiful way of putting it, Lochinvarwelsh--I'm grateful for your words. Pierre, it's always great to hear from you--thank you! I did tell her, Lynne--she was pleased to know that. Thanks for your note. Deborah, hello and thanks a lot! Hi Sam--means a lot coming from such a fine artist/writer as yourself. I sure hope that terrible fire stays away from your neighborhood...scary! Don, thanks for posting this. I liked seeing the comments/reactions. I worried about "forcing" you to do this one, but I think it turned out really well and hope it feels worth it in the end. This one is awesome, Don! Nice perspective and unique subject matter. Not only are the headstones and that statue cool looking but I love the main tree near the center too! Oh Don that last sentence was really spooky! Anyways, just wanted to say that I stopped and started at this for a good bit while scrolling through Google reader. The colors, the light, and the drawing are all exceptional. Best work I've seen in a long while. I'm sure the commissioner is as pleased as you are. Congratulations! Thanks for giving me the opportunity. Hey Dean--how nice of you to say those things! Thank you for the encouragement. Simply amazing Don! This drew me in straight away and I wanted to know more. Thank you for sharing their story and how it touched you. This painting has a way of tugging at your heart strings and after hearing the background story it does even more so. The love of her parents, the love and care of the Italian sculptor and ultimately the love of Anne made it so her story was shared and she was not forgotten. Erin, you put it so beautifully...thank you!